Enough with reminiscing about holiday cookies past, it is time to kick off this years holiday cookie baking! First up on the list was a classic, coconut macaroons ; not to be confused with macarons . Coconut macaroons are really simple containing just shredded coconut, sugar and egg whites to hold it all together. You bake them in the oven until they turn a nice light golden brown on the outside and after they cool they have an amazing slightly crisp outer layer but the inside is nice and moist and tender and oh so good! If you are a fan of coconut then these macaroons are definitely for you! For a lighter and fluffier version you can beat the egg whites and sugar until they form stiff peaks before folding in the coconut. Speaking of coconut, one of the best things to pair coconut with is chocolate and I could not resist drizzling some melted dark chocolate over my coconut macaroons! Mix the egg whites, vanilla, sugar and coconut in a bowl. Spoon the batter onto a parchment paper lined baking pan with 1 1/2 – 2 tablespoons of batter per cookie. Bake in a preheated 350F/180C oven until lightly golden brown, about 10-15 minutes. Meanwhile, melt the chocolate in a double boiler and dip the macaroons in the chocolate or drizzle the chocolate on the macaroons. 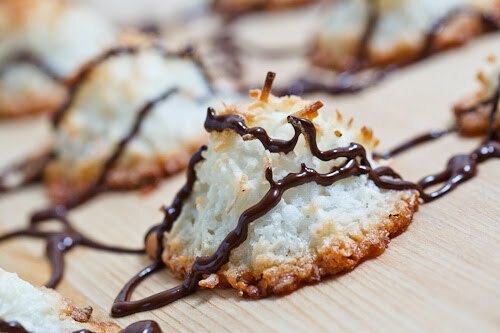 I love coconut macaroons… Especially with just a drizzle of chocolate overtop. These look delicious, thanks for sharing! GREAT way to kick off the cookie season – this is a classic in my book and it almost comes together all by itself…. I love coconut macaroons! I had no idea the ingredients would be so simple. thanks for sharing. I will definitely be making these soon! love these! i need to make them again. i made them once w a graham cracker base (and salt) very good. Thanks for sharing it, I've never made any before but you've inspired me to give it a go! Yum! I'm a sucker for coconut. Gotta try these soon! One of my favorites! Send some on down please! The melted chocolate on top makes them completely adorable! They look delish. These coconut macaroons look heavenly and light. I'm all for a mega dense coconut macaroon. These sound delicious. OH MY GOD!!!! I baked these yesterday too… well you know what they say about great minds… I used ground almonds in mine too and have frozen them for the big day!! !…I'll defrost and do the chocolate thing when I serve them… your's look lovely by the way! Kevin, these look so delicious!! I have this same recipe, and it's soooo good! Like you, I felt it needed some chocolate, but I dip the bottom of my macaroons in melted dark chocolate. YUM! Kevin, these macaroons look gorgeous and perfect for the holidays. Bookmarked! Oh my! I used to adore these. It's been over 20 years since I've last had them. Time to get busy! This is my favorite dessert to make. I tend to use the egg yolks as well so I don't waste them and it gives a creamy texture to the macaroons. My favorite combo – coconut and chocolate! These are beautiful with the chocolate drizzle. These look really tasty!! Do you get your recipes and photos from other sites or are they all you recipes? Reading this post cleared my knowledge of macaroons vs macarons. After starting my own blog I have developed a great interest towards baking. This is on my must try list. Oh, I totally love these…Cashewnut macaroons are a specialty in my home town in India..When I saw all the macarons on the blogs, I was really confused, since the macaroons I knew looked nothing like it ! These look perfect !! I made these yesterday and they came out amazing. They are also so easy to make and perfect to wrap up as holiday treats. i have been wanting to try these for a long time… i have a friend who has been asking for them a lot! I absolutely love macaroons. Yours look delightful. Awesome. oh my dear, i want to be all over these!! score. so good to see you stop by again. FE has missed you! These look so easy I think even I could bake them! They are very well done. I think I will add this recipe to my 'treat' list that I am making for friend this year. I never knew that these heavenly treats were so simple to make. Do you think that they'll travel well or keep together well if they were mailed? Anonymous: If you want to go with the beaten version, you beat the egg whites until they form soft peaks and then add the sugar and beat until they form stiff peaks. Finally you fold in the coconut before baking. i find this to be the best way to use up egg whites. and everyone wins. i don't waste ingredients and everyone around me gets a fabulous treat. love yours with the drizzled chocolate! Moonypants: I have not tried posting them but I would think that they would be ok.
Arch is right, cashew nut macaroons are delicious. Have you tried making macarons? They are a little tricky at first but well worth the effort! And I totally forgot to say that these look delicious as does everything else you post. Man I have to looking at the e-mail that closetcooking.com sent me. All those 21 cookies are making me hungry. I just may have too join weight watchers. Seriously…they look good. I am going nuts for the cookies. quite a few others from this lovely list that I'm going to attempt for the holidays. Hope you have a wonderful holiday!